Former Illinois Gov. Rod Blagojevich is accused of scheming to sell or trade President Obamas old Senate seat for personal gain. Closing arguments in his trial may begin Monday. 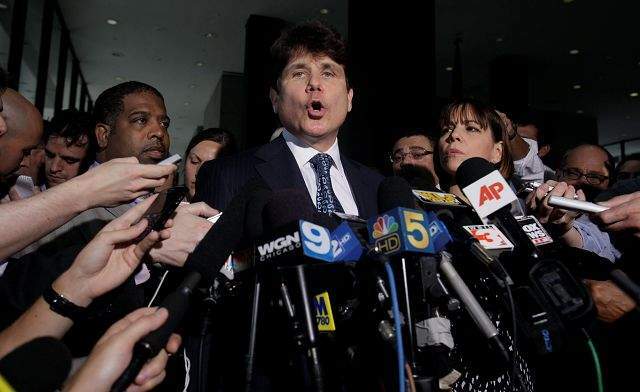 CHICAGO  As Rod Blagojevichs attorneys prepare to make their last pitch to jurors, their closing arguments may come down to this: The former Illinois governor wasnt capable of doing anything but talk. And talk. That leaves prosecutors with the challenge of persuading the jury that, as ineffective as he might have seemed, Blagojevich wasnt just talking. He was conspiring. And conspiracy is a crime. None other than U.S. District Judge James B. Zagel alluded to the question Thursday when he tried to summarize the arguments that jurors likely will hear from both sides Monday. The tapes really have a lot of talk that seems like blowing off steam ... as opposed to doing, the judge said at a hearing where he refused to dismiss the charges. But if Zagel suggested that Blagojevich was desperate and perhaps delusional, the judge also made it clear that the defendants lack of success in obtaining money or a new job may not matter. Blagojevich attorney Lauren Kaeseberg insisted that the prosecutions case was built on talk. That means if Ive researched a crime, Ive attempted to commit that crime? If Ive talked about a crime Ive attempted to commit that crime? Kaeseberg said. But the prosecution can wage a counterargument: That even if Blagojevichs comments sounded like jokes  wondering what life would be like if he became ambassador to India, or suggesting that Barack Obama might ask him to join the White House Cabinet  that talk did trigger action. Prosecutors said Patti Blagojevich did research the salary of a private foundation as she spoke to her husband on the phone. And one of Blagojevichs top aides did research ambassadorships. Blagojevichs attorneys have sought to exploit some of the more embarrassing revelations of the trial  that their client was so lazy he showed up to his office as little as two hours a week and sloughed off so much of his work that a top aide actually signed bills into law. How, they might ask jurors, could the same man who hid in the bathroom to avoid discussing the state budget be capable of shaking down the president in exchange for appointing Obamas choice to his old seat in the U.S Senate? And why didnt Blagojevich follow up on threats to punish companies that didnt find his wife a job by cutting them off from state business? Why didnt he make good on threats to kill a Wrigley Field deal sought by The Chicago Tribunes parent company if the paper didnt fire writers who had blasted him on the editorial page? But, he said, the defense team will have trouble if they try to convince jurors that Blagojevich wasnt serious.